Child playing hockey -- outdoor rink. When thinking about hockey party ideas, a game of hockey is certainly a fun choice of party activity. Sometimes, however, an actual game of hockey is not easy to coordinate when the party is at home or in a space without a rink or playing field. Fortunately, these hockey party games provide alternatives that can be just as much fun. If you will be playing a game of ice or inline hockey at your party, guests can play this fun matching game with their own hockey skates. Have kids gather and put one of their two skates into a pile. Mix up the pile of skates. Then, blindfold each player and send them into the pile to retrieve their second skate. Players who come out with the correct match receive a small prize. If kids won’t be using skates during your party, you can play another skate-matching game. Make one pair of paper cutout skates for each party guest. When making the skates, use a different colored paper to make each pair. Hide one skate from each pair around the party space. Hand out the remaining colored skates to players. Set a timer and see who can find their matching skate before the buzzer rings. Divide guests into two teams. Give each team a matching set of hockey gear, such as a jersey, face mask, hockey stick, and elbow pads. On the “go!” command, the first player in line for each team must put on all of the hockey gear, run to the other side of the room, and then return to his teammates. Once back at the starting line, the first player must remove the hockey gear and pass it to the next player, who must repeat the same actions performed by the first player. This race continues until everyone has had a turn to run the race while wearing the hockey uniform. The first team to finish the relay wins. To play this game, set up two nets. If you don’t have nets, you can use large cardboard boxes or laundry hampers that have been turned on their sides so that the openings face each other. Divide kids into teams and have each team stand in front of their nets. Give each team a bucket of foam balls (you can even use crumpled up newspaper). Set a timer for one minute and challenge teams to shoot their balls into the opposing teams net. Players must try and defend their nets while trying to score on the opposing team at the same time. After one minute, count how many balls are in each net. The team that scored the most goals on the other wins the game. Divide the kids into two teams and have them line up behind a starting line. Several feet away from the line, set up a hockey net. Give each team a hockey stick and a beach ball. Players must use the hockey sticks to push the beach balls into the net, and then back to their teams, where the next players in line will take the sticks and do the same. The first team to have all its players complete this task wins. Stand a set of bowling pins in front of a net. To keep with the hockey theme, paint two-liter bottles in your favorite team colors, and then attach hockey labels to them. Use these as your bowling pins. Have kids try to knock down the pins by shooting a puck at them with a hockey stick. Keep score just like in a standard game of bowling. To play this game, you will need two hockey pucks per player. (You can use real hockey pucks or any disc-shaped item, such as jar lids, checkers or even homemade, foam hockey pucks.) Paint a dab of color on the bottoms of each hockey puck, using the same color only twice, to create matching pairs of pucks. Mix up the pucks and arrange them on a table with their colored sides facing down. Kids take turns turning over two pucks at a time to see if they can make a match. When a player makes a match, remove that pair of pucks and the player from the game. As players come out of the game, award them a small trinket prize. Kids continue to take turns until everyone has found a matching set of pucks. This game is played like the traditional playground game of freeze tag. The player who is “it’ is called the referee. The rest of the kids are considered hockey players. When the referee tags a hockey player, instead of freezing in place, he is sent to the penalty box (a pre-determined section of the play area), where he must wait for another player to come and free him. If a player is caught while trying to rescue another from the penalty box, that kid must switch places and become the referee. 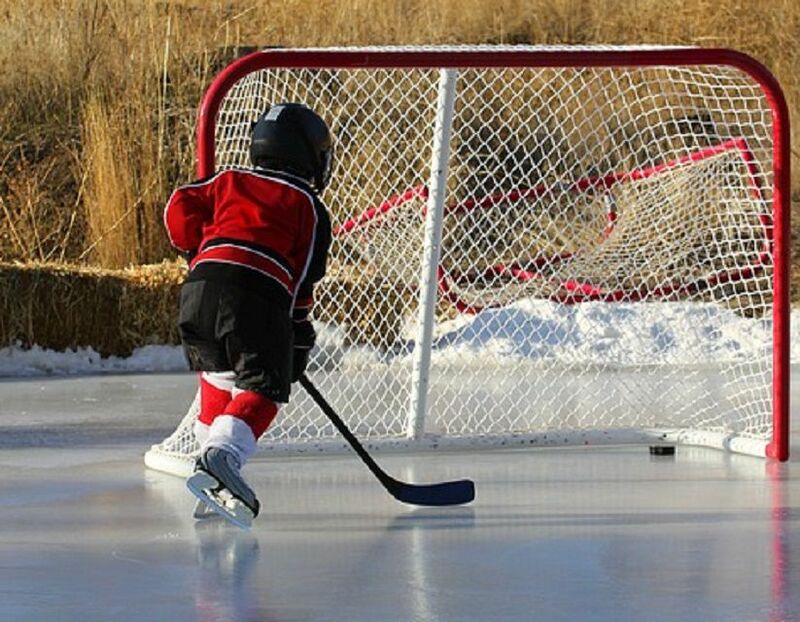 Have kids stand behind a line and shoot for the net. One turn at a time, keep shooting pucks into the net, counting one point per goal scored. The first player to score three points wins the hat trick game. You can have an adult stand at the net as the goalie, or simply design a net area that is narrow or far enough from the shooting line to make it challenging for your age group. Divide your party guests into two teams. Have them line up, facing each other just as the players would in a real hockey game faceoff. To keep things safe, however, give each kid a pool noodle instead of a hockey stick. Rather than a hockey puck, drop a foam ball into the middle of the crowd. Kids then faceoff to see which side can gain control of the ball with their noodles. Draw a target board inside the net area. Have kids stand behind a designated line and shoot for the net. Players score points according to where puck lands in the target. You can draw your own variation of a round, bullseye-style target or just go with a series of lines with graduating point values per distance, kind of like the game of shuffleboard.